"The murder investigation allows Loewenstein to probe into the lives of proud people who would never expose their troubles to strangers. People like John Hodge, the town's most respected lawyer, who knocks his wife around, and kindhearted Etha Jennings, who surreptitiously delivers home-cooked meals to the hobo camp outside town because one of the young Civilian Conservation Corps workers reminds her of her dead son. Loewenstein's sensitive treatment of these dark days in the Dust Bowl era offers little humor but a whole lot of compassion." "This striking historical mystery...is brooding and gritty and graced with authenticity." "The Depression and a 240-day-long dry spell drive the desperate townspeople of Vermillion, OK, to hire a rainmaker, but he's murdered, leaving sheriff Temple Jennings to investigate. Loewenstein's terrific historical mystery wears its history lightly and its humanity beautifully. The first in a series, it's a realistic, expertly drawn novel with characters you'll come to love." "The plot is compelling, the character development effective and the setting carefully and accurately designed...I have lived in the panhandles of Texas and Oklahoma; I know about wind and dust...Combining a well created plot with an accurate, albeit imagined, setting and characters that 'speak' clearly off of the page make Death of a Rainmaker a pleasant adventure in reading." "Set in an Oklahoma small town during the Great Depression, this launch of a promising new series is as vivid as the stark photographs of Dorothea Lange." "After a visiting con artist is murdered during a dust storm, a small-town sheriff and his wife pursue justice in 1930s Oklahoma. A vivid evocation of life during the Dust Bowl; you might need a glass of water at hand while reading Loewenstein's novel." 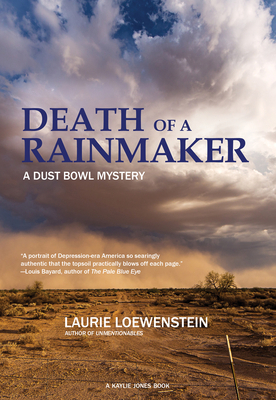 "Laurie Loewenstein's new mystery novel...expertly evokes the Dust Bowl and the Great Depression...Loewenstein's novel sometimes reads like a combination of a Western and a mystery. But that genre mishmash works." "The plot is solid in Death of a Rainmaker, but what makes Loewenstein's novel so outstanding is the cast of characters she has assembled...Death of a Rainmaker is a suburb book, one that sets the reader right down amid some of the hardest times our country has faced, and lets us feel those hopeful farmers' despair as they witness their dreams turning to dust." When a rainmaker is bludgeoned to death in the pitch-blackness of a colossal dust storm, small-town sheriff Temple Jennings shoulders yet another burden in the hard times of the 1930s Dust Bowl. The killing only magnifies Temple's ongoing troubles: a formidable opponent in the upcoming election, the repugnant burden of enforcing farm foreclosures, and his wife's lingering grief over the loss of their eight-year-old son. When the investigation closes in on Carmine, Temple's wife, Etha, quickly becomes convinced of his innocence and sets out to prove it. But Etha's own probe soon reveals a darker web of secrets, which imperil Temple's chances of reelection and cause the husband and wife to confront their long-standing differences about the nature of grief. Laurie Loewenstein is the author of the best-selling novel, Unmentionables. An Ohio native, she currently lives in Columbia, Maryland.